This vegan chocolate cake with extra chocolate frosting is THE BOMB!! The best thing is it’s so incredibly easy and you don’t need any fancy ingredients. It’s one of my favorite vegan cake recipes! I mean just look at it. Doesn’t it look gorgeous with all these berries?! Making vegan chocolate cake really couldn’t be much easier. At least with this recipe. This ingredient list sounds pretty manageable, doesn’t it? You probably already got most of these ingredients in your pantry. As always, you can find the full ingredient list for the vegan chocolate cake in a separate printable recipe box beneath the text section. Just combine all ingredients in a large bowl and stir with a wooden spoon until you got a smooth batter. Then pour the dough into a cake springform pan. I used a 10 inch spingform pan. Bake for about 30 minutes. It’s best to test with a skewer to see if the cake is done or if you need to adjust the baking time a little bit as every oven is a bit different. The main ingredient in my vegan chocolate icing is avocado, which works so great! And it’s also so much healthier than traditional chocolate icing. And it’so rich! Making vegan chocolate icing with avocado is pretty easy. Just combine two avocados with cocoa powder, maple syrup or agave, melted coconut oil, and vanilla extract. Blend until smooth. That’s it! 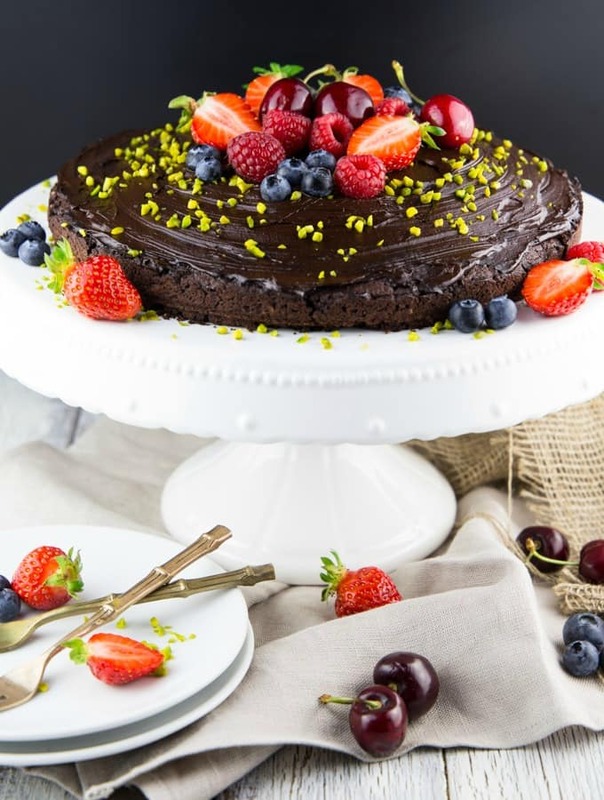 Once the vegan chocolate cake has cooled down, evenly spread the vegan chocolate frosting on top and garnish the cake with fresh berries and pistachios. They make it look so decadent! It’s also the perfect vegan birthday cake. I also love using this vegan chocolate avocado frosting for cupcakes. I hope you like this easy vegan chocolate cake as much as I do! As always, I love hearing from you guys. Whether it’s on Instagram, Facebook, or directly on the blog. Your comments really make my day! Looking for more vegan chocolate recipes? Then check out this roundup of 27 drool-worthy vegan chocolate recipes. This vegan chocolate cake with extra chocolate frosting is THE BOMB!! The best thing is it's so incredibly easy and you don't need any fancy ingredients. It's one of my favorite vegan cake recipes! Use a 10 inch spingform pan. In a large bowl, combine all ingredients and stir well with a wooden spoon. Lightly grease a 10 inch springform and pour the batter into the springform. Bake at 350 °F for 30 minutes. It's best to test with a skewer to see if the cake is done or if you need to adjust the baking time a little bit as every oven is a bit different. Remove from the oven and allow to cool down for about 30 minutes. Make the vegan chocolate frosting: In a food processor combine all ingredients and blend until smooth. Evenly spread the avocado chocolate frosting on the chocolate cake. Sprinkle with pistachios and top with fresh berries. Enjoy! This looks SO good! I could totally eat the entire cake. Who can say no to chocolate?! And I love avocado frosting. So good and healthy and yummy! Simple perfection! I usually use oil, and am curious now about the buttery spread with chocolate – it must be quite rich! Yuo can’t beat a great chocolate cake. Looks wonderful! Chocolate cake is my all-time favorite. I can eat this whole cake within few minutes! I will try this one too. Ok so this is the second or third recipe I’ve made from your blog and I have to say this is the first place I check now. The cake was delicious and moist and the frosting…. Lordy. As usual your recipe deserves more than 5 stars. I doubled the cake recipe and used my KitchenAid. I mixed all the wet ingredients then added the dry ingredients ending with the flour so as not to over mix it. I was skeptical since it’s not like the batter I made when I was Omni, it was thicker and I’d say almost dry. But I scooped it into two 9’’ pans and trusted your expertise. Boy am I glad I did. They turned out perfect! 30 minutes on the dot and they were ready. I used my Ninja blender for the frosting, doubling the recipe again to cover both cakes. I had to use some soy milk to thin it out a bit to my own personal preferences but the flavor was perfect.